Hu B^*, Jiang Z^, Wang W^, Qiu Y^, Zhang Z, Liu Y, Gao X, Liu L, Qian Y, Huang X, Yu F, Li A, Kang S, Wang Y, Xie J, Cao S, Zhang L, Wang Y, Xie Q, Kopriva S, and Chu C* (2019) Nitrate-NRT1.1B-SPX4 cascade integrates nitrogen and phosphorus signaling networks in plants. Nature Plants doi: 10.1038/s41477-019-0384-1. Hu B, Wang W, Ou S, Tang J, Li H, Che R, Zhang Z, Chai X, Wang H, Wang Y, Liang C, Liu L, Piao Z, Deng Q, Deng K, Xu C, Liang Y, Zhang L, Li L, and Chu C* (2015) Variation in NRT1.1B contributes to nitrate-use divergence between rice subspecies. Nature Genetics 47(7): 834-838. doi: 10.1038/ng.3337. 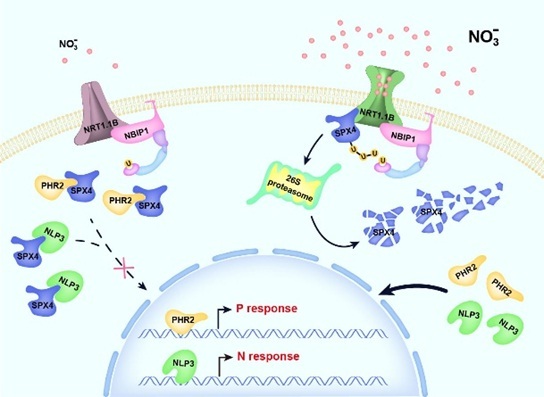 Poza-Carrión C & Paz-Ares J* (2019) Nutrient signalling: When nitrate and phosphate sensors meet. Nature Plants. doi: 10.1038/s41477-019-0403-2.